Replace the passenger presence system as a complete assembly to prevent possible injury to the occupant. All the components in the service kit are assembled and calibrated as a unit. Using only some of the components in the service kit will cause the passenger presence system to operate improperly. To avoid personal injury, perform a preload test on the passenger presence system whenever you remove or replace the seat cushion trim. Failure to do so may cause the system to malfunction. Remove the front passenger seat. Refer to Driver or Passenger Seat Removal and Installation. Remove the front seat cushion cover and pad. Refer to Front Seat Cushion Cover and Pad Replacement. 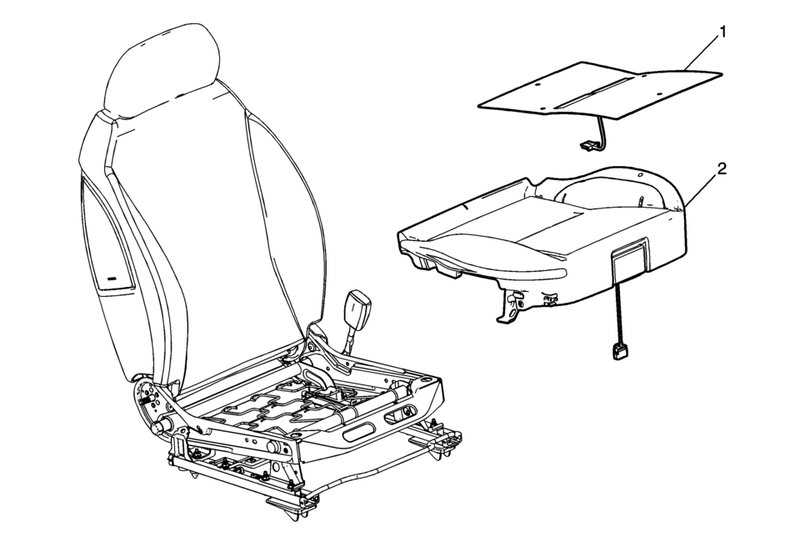 If either the seat cushion heater or one of the components of the passenger presence system need replacement, both the seat cushion heater and the complete passenger presence kit must be replaced. Re-zero the inflatable restraint passenger presence system whenever the seat cushion or any component of the passenger presence system is removed. Refer to Control Module References. Program the inflatable restraint passenger presence system after replacement. Refer to Control Module References. The passenger presence system is an integral part of the pad on the passenger seat cushion. The sensor, module and seat cushion pad must be replaced as a unit. Note the routing of the wiring harness and connector location for installation.